Want to fast track your skills to develop a better plan? Want to get results quicker? 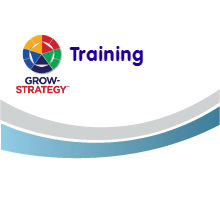 Our training programs enable you to acquire new skills and stay current with GROW Strategy by choosing the training option that works best for you. Our goal is to maximise your ROI with the rapid adoption of the GROW|STRATEGY application to drive your business growth. We aim to deliver training and education that is relevant, comprehensive, timely, and cost-effective. We strive to accommodate all learning styles, so that you can decide how and when you’ll learn. 1. Learn-on-Demand: Webinars offer group sessions at an affordable price, with topics grouped by each of the 9 steps of GROW|STRATEGY and also by the skill level of the participant (Introduction=101, Core=201, Advanced=301). 2. Learn-in-Private: We can arrange one-on-one private training workshops or exclusive group training sessions for your team, at your nominated venue and date – via face-to-face workshops or via virtual classroom delivery.